The Colorado River District is holding State of the River Meetings. Each spring, during snowmelt runoff, the River District organizes informational “State of the River” meetings across parts of the Western Slope of Colorado to help educate the public and water users. Meeting speakers offer up-to-date information on snowpack figures, water supply forecasts and anticipated stream flows and upcoming conditions. To see the list of 2017 State of the River Public Meetings, visit their website. 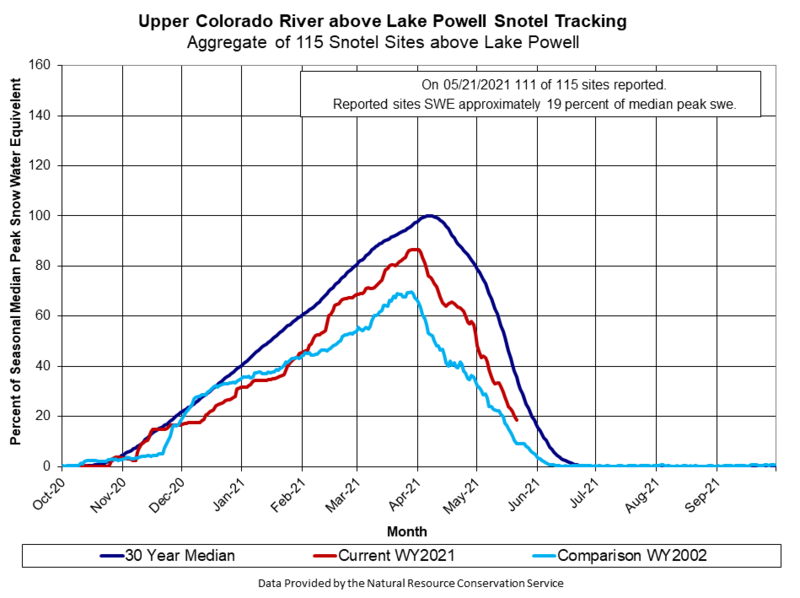 The amount of water in the Upper Colorado Basinwide snowpack peaked early, started to melt and then bumped back up, before dropping steeply again. Similar stories unfolded in the sub-basins, with the Upper Green and Duchesne groups showing the most impressive peaks and the Yampa/ White group the only one to post lower than average numbers. To see how the total accumulations by month add up in Colorado's basins, choose the stacked bar option on this page. The Hermit's Peak Water Alliance will be holding the 5th annual Gallinas River Clean Up on Saturday, June 3rd. Sign-up is free while you have fun walking and running and helping clean the river. Trash bags and gloves will be provided and snacks and coffee will be provided. Running tips and warm ups at 8:30 am, fun run at 9:00 am, and river clean up at 9:30 am to 12:00 pm. For more information contact Katie at 426-7505. Adopt-A-Park Cleanup: Calling for a few volunteers on Sat., June 3, 2017 @ 8:30 a.m. to Noon @ Rollans Park, Ridgway. Join UWP to clean up Rollans Park. Everyone of all ages (as long as parents accompany children) is welcome to help pick up trash and fallen branches, and get the park into shape for its summer visitors. Snacks and drinking water are provided– you bring some work gloves and sunscreen. To register and for more information, go to the Park Cleanup web page. In 2017, MSI will continue an Animas River water quality monitoring program at Rotary Park in Durango, CO, that began in 2015 during the Gold King Mine release. The monitoring program is part of a partnership between MSI and the City of Durango to provide the public with an independent assessment of Animas River water quality during the May to August timeframe when river recreation is at its peak. Thier goal is to get water quality results to the public as quickly as possible. They plan to expedite laboratory analysis and communicate results to the public through MSI’s website and social media,” said Scott Roberts, MSI aquatic ecologist. Latest results can be found at www.mountainstudies.org/AnimasRiver. How is the health and ecology of the Cache la Poudre River, today? The City of Fort Collins’ State of the Poudre River project seeks to answer this question scientifically. Everyone is invited to learn more about the health of the Cache la Poudre River at an open house and through two new publications, the Poudre River Report Card, and the State of the River Report, plus a new online mapping tool to explore river health spatially. The new publications will first be available at an Open House, Thursday, May 25, 4-7 pm at Fort Collins Museum of Discovery, Classrooms, 408 Mason Court, Fort Collins. Participants can talk to project managers, understand the findings, and celebrate the project completion.The River Health Report Card is a summary of the in-depth State of the River Report. The online mapping tool allows users to explore river health results by specific locations. A healthy Poudre River corridor provides many important social, environmental, and economic benefits to the community.